Along the 1,800-mile river basin, locals wrestle with water demands. Jordon Lahti (left) and Jeff Montebone prepare to herd cattle from their summer grazing area on the Thompson Divide, an area of proposed gas drilling. Click image to enlarge. Locator maps. Click to enlarge. The effects of lingering drought, and the unrelenting demand for water from farmers, cities, and energy producers converged today at Lake Mead, which drained to its lowest level since 1937 when the Hoover Dam closed off the Colorado River to begin filling the largest reservoir in the United States. In dropping to a record-low water level the huge lake, which straddles the border between southern Nevada and northwestern Arizona, has emerged as an important measure of water insecurity in the American West. Just as gasoline prices serve as a national gauge of American economic stress — relieving psychic pressure as prices go down, causing strain as they rise — Lake Mead’s steadily declining water levels are a visible and widely reported gauge of intensifying water scarcity in the fastest growing region of the United States. Lake Mead sits near the end of the Colorado River, which stretches 2,900 kilometers (1,800 miles) across seven U.S. states before entering Mexico. Its course is through one of the earth’s grandest landscapes. Lake Mead reflects the mammoth scale of the geography and its drying condition. The lake, 193 kilometers (120 miles) long, supplies water to 40 million people in two countries. 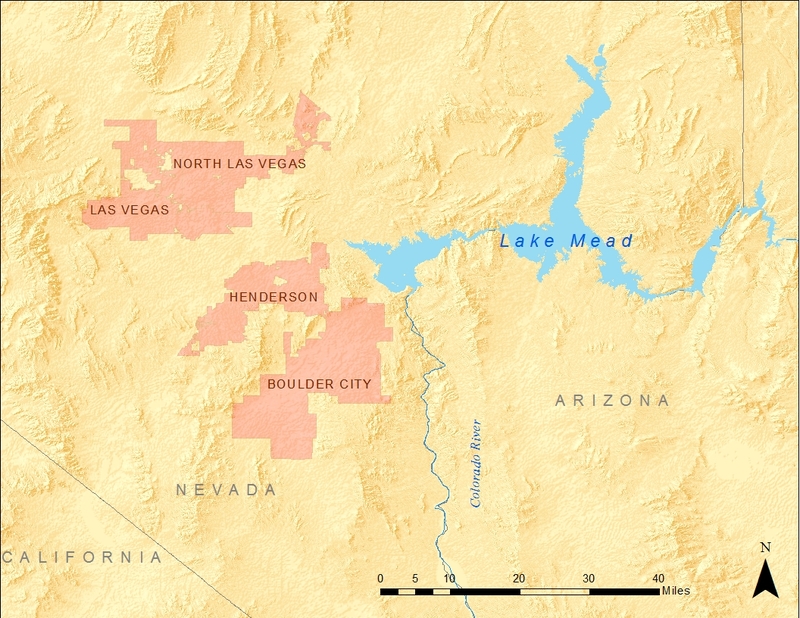 The federal Bureau of Reclamation announced last summer that there will be a record low release of water this year from Mead’s sister reservoir Lake Powell, a move that could prompt limits by 2016 on water deliveries to two states in the Colorado River’s Lower Basin. Last year, American Rivers, an advocacy group, placed the Colorado at the top of its annual list of the nation’s most endangered rivers, citing threats like dam projects, warmer weather, municipal water diversions, and changes to the river’s flow. And though heavily regulated by dams and canals, the Colorado River can scarcely meet current water demands, let alone the future pressures from population growth and climate change, according to a Reclamation study, released in December 2012. Today, Lake Mead is over 60 percent empty. The last time the lake was full was in 1983. 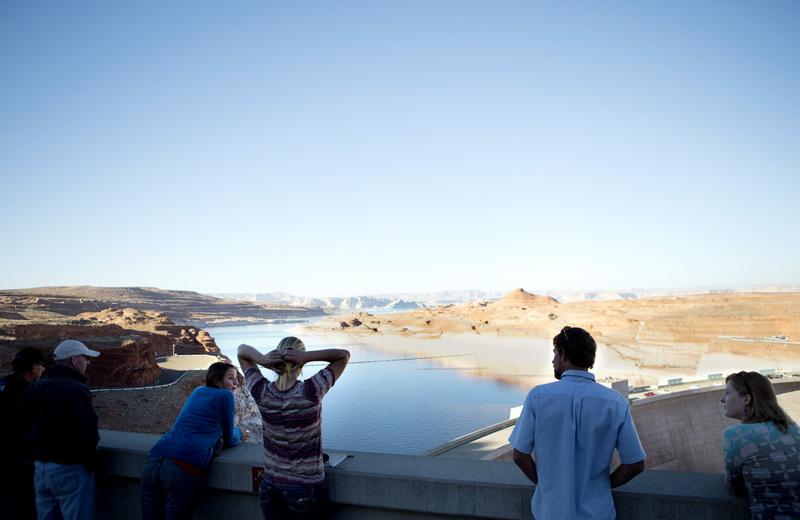 Students look over Lake Powell from the Glen Canyon Dam during an educational trip about water and energy on the Upper Colorado River with Eco-Flight. Click image to enlarge. The Dolores River Basin is seen south of Grand Junction. The river is a major tributary of the Colorado River. Energy and resource development, as well as irrigated agriculture, have played rolls in threatening the river’s flow. Click image to enlarge. Lorie Syme (60) of Montrose — a small city with just over 40,000 people — looks out at a gas pipeline valve in Battlement Mesa during a tour of drilling sites led by Western Colorado Congress. Syme went on the tour because she wanted to learn more about the natural gas boom that has taken place in Colorado and across the country in recent years. Click image to enlarge. In the rural farm counties and growing cities in the Colorado Basin, and especially in and around Las Vegas, which draws its drinking water from Lake Mead, the civic discomfort over Lake Mead’s declining water levels is steadily evolving into alarm. Ranchers and kayakers, farmers and energy developers, families and government leaders seek solutions amid a mass of conflicting interests, concerns about costs, accuracy of forecasts, and other issues that are not easily resolved. Just before the turn of the century, Bill O’Leary enjoyed boating trips to Baja California, where the Colorado River once flowed into the Sea of Cortez. But drought, population growth, and energy demands on the river have rendered it dry a few miles shy of the Gulf of California. Except for an experimental release this spring, not a drop of water from the Colorado River has reached the sea since 1998, leaving little fresh water for the delta ecosystem at the river’s mouth. “This is the lowest I have ever seen the river,” said O’Leary, formerly a biology teacher from Michigan who has been farming in the Basin for 40 years. Having moved to northwest Colorado in the mid 1970s, O’Leary now sells potatoes and lettuce at the farmers’ markets in Carbondale, Glenwood Springs, and Parachute, towns that are within a two-hour drive from his fields in Grand Junction. Last summer, O’Leary decided to try a farming tactic that uses less water, because he believes that the standard system of irrigating with sprinklers is inefficient and wasteful. 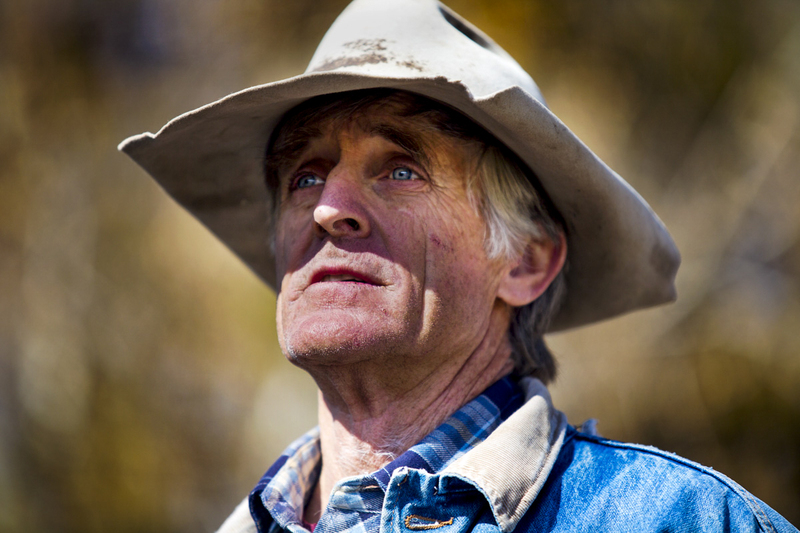 Produce farmer Bill O’Leary of Parachute is very concerned about drought and water scarcity. He is trying new methods to continue his farming, but the drought forced him to sell some of his horses because he could not afford to feed them. Click image to enlarge. From the headwater state of Colorado — growing corn, hay, wheat, vegetables, and fruit — to the Imperial Valley of California — supporting grazing livestock, alfalfa, carrots, lettuce, wheat, cantaloupes, onions, asparagus, orchard crops, and vineyards — a variety of food is grown in some of the driest Western states because of access to supplies from the river, as noted by Colorado River Water Users Association. Until her retirement this past winter, Joan Mayer was an education specialist with Glen Canyon National Recreation who often spoke with large groups of students about water and energy conservation along the Upper Colorado River. 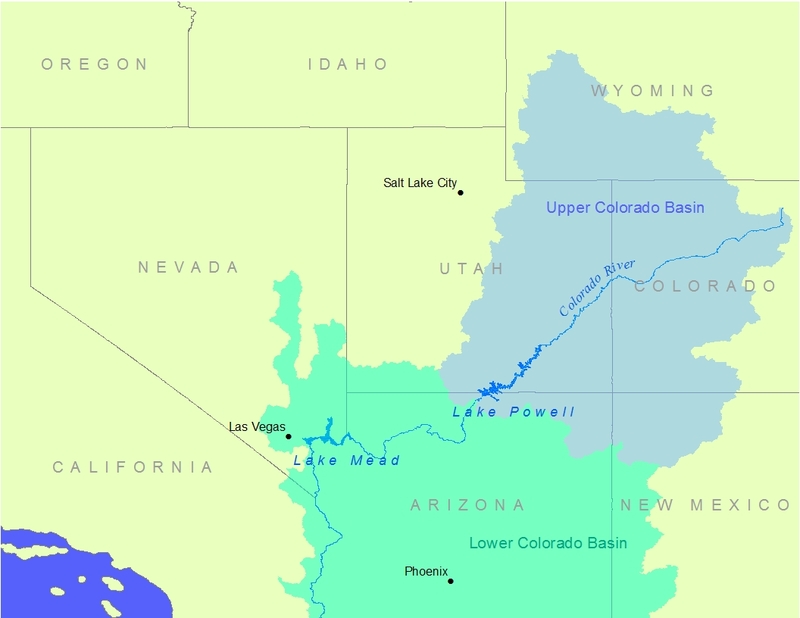 During an educational talk at Glen Canyon Dam in October 2012, Mayer explained that much of the crops that are grown in the United States come from the Colorado River, which irrigates close to 2.2 million hectares (5.5 million acres) of land, according to the Bureau of Reclamation’s Colorado River Basin Supply and Demand study. “You have the Colorado River coursing through your veins,” she said to a group of Colorado college students, making the connection from the river in front of them to the food they had eaten earlier that morning. Not only is water used to dampen dirt roads and to increase well pressures for some natural gas and oil extraction processes like fracking, water also is used for steam to run turbines and for cooling nuclear and coal-fired power plants. In fact, irrigation and energy are two of the largest straws that draw on the Colorado River. There is a big difference between water use and water consumption. Water use means that water is drawn from a source — groundwater or surface water — and is used for applications like cooling power plants or for domestic use such as dishwashers or showering, and then the water is put back to the source where it came from. Water consumption, on the other hand, is water that is not returned to the source. For example, some of the water that is diverted to cool power plants or for irrigation can be lost to evaporation. Another situation is when water has been contaminated past the point of being put back, such as in hydraulic fracturing. Though energy is a big water user, it accounts for no more than a few percent of total consumptive use on the Colorado River — water consumption from the energy sector peaked in the early 2000s at roughly 200 million cubic meters (162,000 acre-feet) per year. Over the past three decades, meanwhile, agricultural consumption of the Colorado River is more than 50 times greater, at nearly 10.7 billion cubic meters (8.7 million acre-feet) per year, according to the Bureau of Reclamation. “You want desert, you got desert. You want mountains, you go to the mountains,” said Brad Kesler, a local independent water truck driver who has lived in Rifle, Colorado, for 20 years and loves the area. Kesler’s full-time job involves filling his truck at Last Chance Irrigation Ditch along the Colorado River, off of Interstate 70 between Rifle and Battlement Mesa. He will use 15 cubic meters (4,000 gallons) of water in one day to keep the dust down on stretches of dirt roads that lead to natural gas-extraction areas. Meanwhile, other traffic on the dusty stretch includes a school bus full of concerned citizens who are taking a tour of gas-drilling sites in Battlement Mesa and nearby Parachute Creek, two small western Colorado communities that are smack in the middle of an area with a deep history of energy extraction. 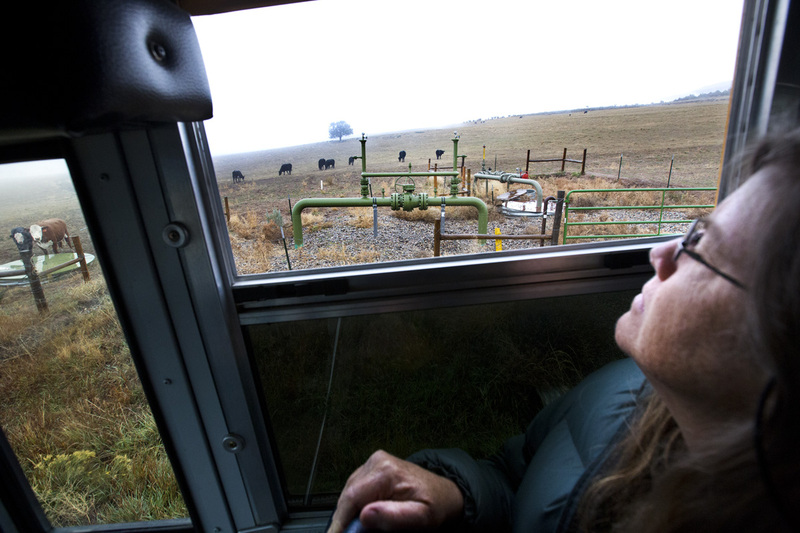 Peering out the window, 60-year-old Lori Syme of Montrose — a small city with just over 40,000 people located about 160 kilometers (100 miles) to the south through the mountains — watches as the bus rolls past several natural gas wells in Battlement Mesa. “There’s another over here. Wow, look at that rig,” she said to others on the tour of Garfield County. The tour was led by Western Colorado Congress (WCC), an organization of citizens who work on social, environmental, and sustainability issues. Garfield County is one of the top natural gas-producing counties in Colorado and has been featured in numerous documentary films, including the award-winning Gasland, which examined the repercussions and dangers of a production technique called hydraulic fracturing. Fracking, as it is commonly called, is combined with horizontal drilling and has opened shale gas reserves across the country. 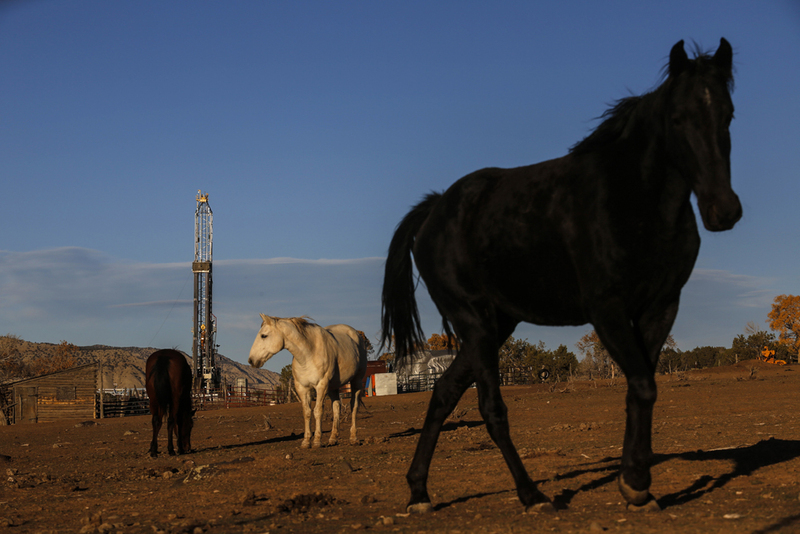 Thousands of wells are currently being fracked in Colorado alone. The process, which uses millions of gallons of water per well, has been highly criticized due to much concern over polluted water tables. A directional natural gas well is drilled on private land in Parachute. Gas drilling supports the economy. Local activists are fighting for stricter drilling regulations. Click image to enlarge. 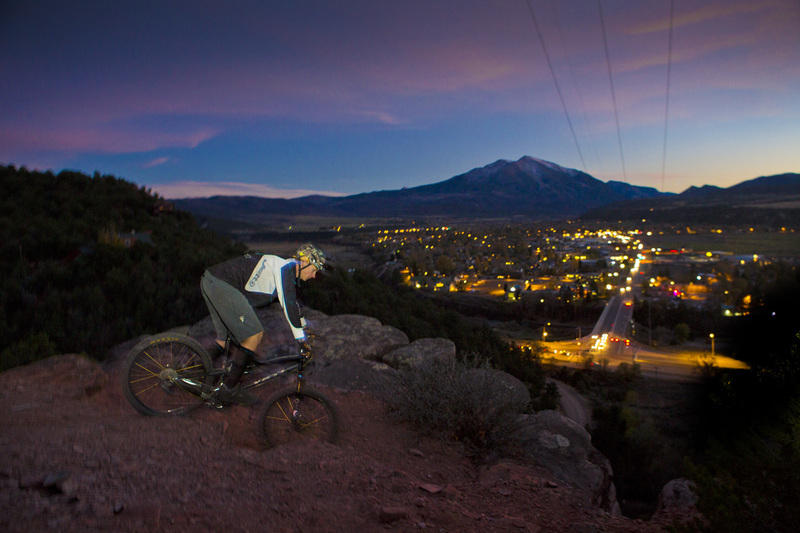 Shawn Taylor of Snowmass Village rides his bike on Red Hill, overlooking the town of Carbondale. Mount Sopris, off in the distance, and the surrounding landscape are also a playground for the outdoors-minded residents. Carbondale veils the Thompson Divide, where local ranchers are offering to buy oil and gas leases to prevent drilling on public land. In addition, the Hidden Gems Campaign has proposed “wilderness area” on potential drilling sites. This has upset some bikers and climbers because pieces of their playground would no longer be available to them. Wilderness areas are foot traffic only. Click image to enlarge. 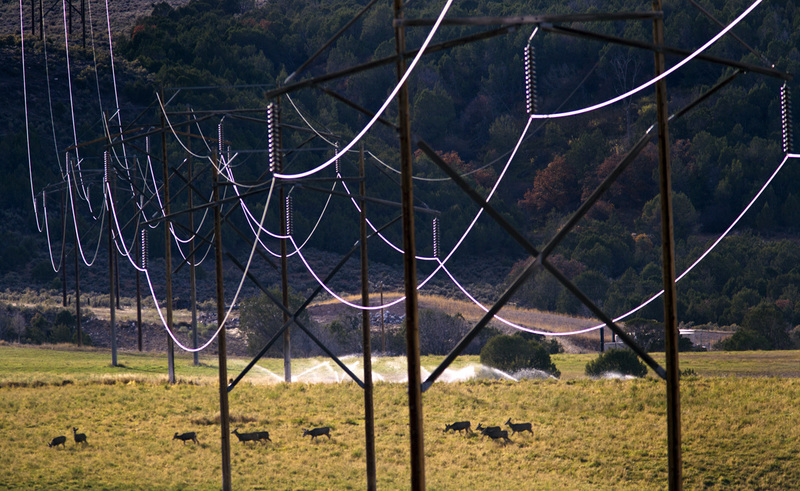 Deer graze on irrigated ranching land underneath the power lines in Parachute, which is also an area for hunting. If it were not for irrigation from the Colorado River, the desertscape would not enable grazing for local wildlife in the area. Click image to enlarge. Still, locals in the area are divided on the issue of drilling for natural gas. While organizations such as WCC are working for stricter regulations on oil and gas companies, there are many like Brad Kesler who depend on the gas industry for their livelihoods and see the situation differently. “I think it is important for her to grow up on her own family’s ranch, because it will give her a place to roam,” said Roy Savage about his four-year-old daughter, Abigail, as he holds her hand and walks past his home. The house overlooks an expansive land full of cows, an irrigated drinking pond for the cows, and an assortment of natural gas wells. Savage takes Abigail to see his friends, avid hunters, who are gutting a deer that they shot. It had been grazing near the gas pads on Savage’s land. The Colorado River is a key source of electricity for the West, particularly to handle the peak hours when home appliances and lights are switched on. However, the amount of electricity generated by the Hoover Dam holding back Lake Mead and the Glen Canyon Dam holding back Lake Powell has dropped along with the water levels in their reservoirs. In August 2013, the Hoover Dam’s generating capacity was 1,735 megawatts, almost 17 percent below its 2,085-megawatt capacity when Lake Mead is full. Savage understands the push and pull between water users in the Colorado River Basin all too well. A rancher turned energy entrepreneur, Savage flipped his business model upside down because of the dry years. In addition to leasing the mineral rights for what lies below the surface, Savage also rents his land to other ranchers to graze their cattle. Bill Fales, owner of Cold Mountain Ranch, looks out over his cattle. 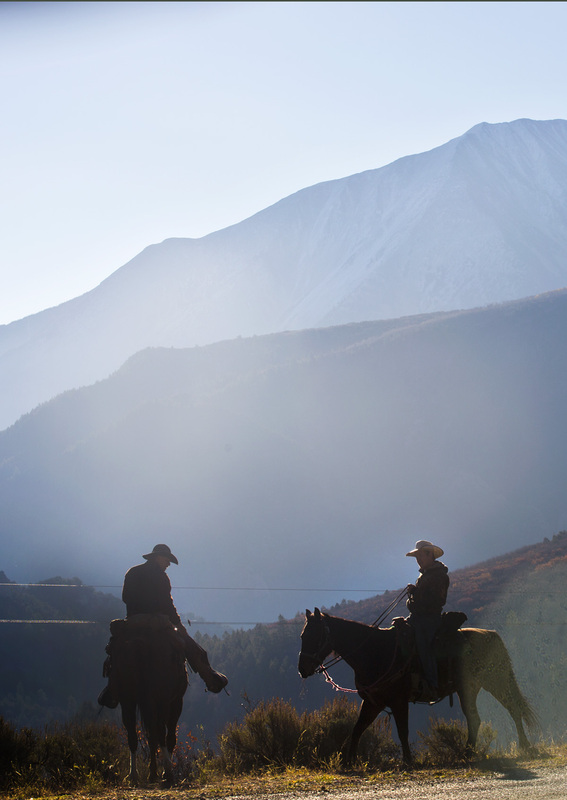 He loves ranching and is doing everything he can to protect Thompson Divide from gas drilling. Click image to enlarge. Ty Jocaber, Ria Jocober, Wilder Jocober, and Jordon Lahti prepare to sort cows after bringing them down from the warmer feed land of the Thompson Divide. Click image to enlarge. 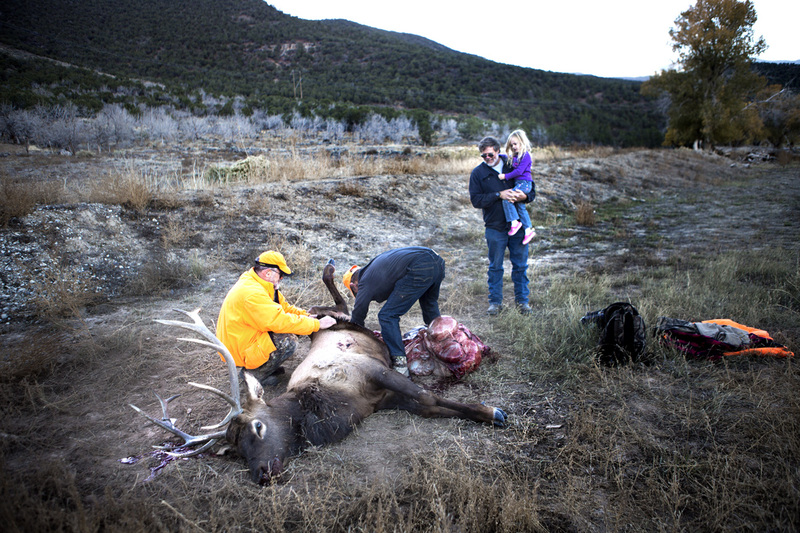 Michael Lewis (left) and Thomas Ball, both from Maine, gut an elk that they shot on Roy Savage’s land. Savage watches while holding his 4-year-old daughter, Abigail. 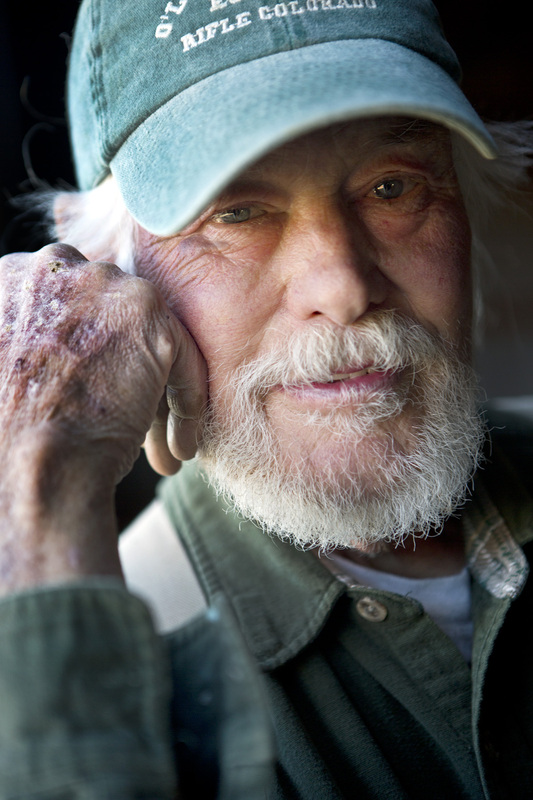 Savage grew up ranching, but sold his cattle because of the drought. He has been able to keep his land by allowing gas and oil companies to drill on it, and he also allows other ranchers to lease it for their cattle. Savage hopes to buy back some of his cattle one day. Click image to enlarge. Savage hopes to buy back some of his cattle one day. But for now, the gas wells on his property keep him from losing his land. He is concerned about pollution incidents that have occurred nearby, presumably from gas drilling, especially since he pumps well water out of the Colorado River aquifer for domestic use. Despite this, he believes that “as far as pollution is concerned, the oil and gas industry is probably less of a threat than the general public,” due to people dumping chemicals and overusing fertilizer. Savage is also not too concerned about long-term water shortages. In another world, just 64 kilometers (40 miles) east of the historically gas-driven economy of Garfield, is Cold Mountain Ranch. Here, William Fales manages to keep his 300 head of cattle — which graze on a wide-open valley of alfalfa and irrigated grass — but not without a fight. Drought and the possibility of natural gas development in the nearby high country have Fales concerned about his water source. Fales and his wife, Marj Perry, pride themselves on raising local grass-fed beef. The ranch has been in Perry’s family since 1924. 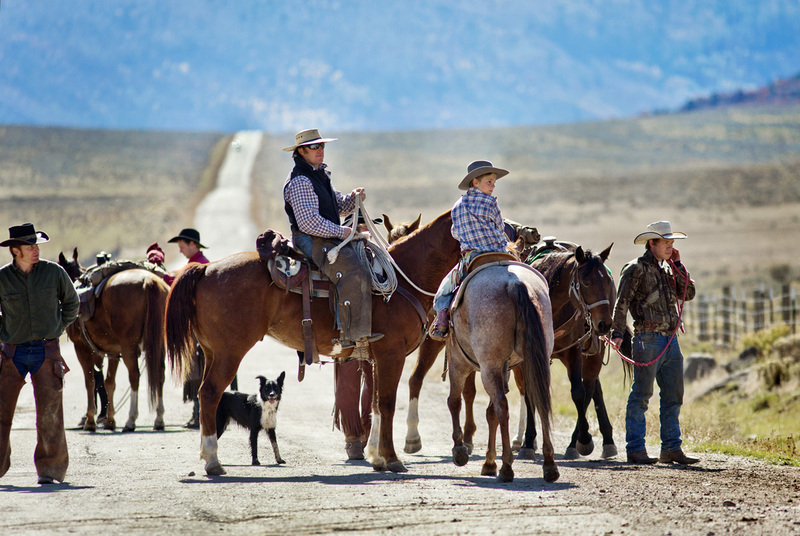 Bill and Marj and their two daughters love ranching and being on the land. Located just under 2,400 meters (8,000 feet) in elevation and surrounded by ski towns of the Roaring Fork Valley, visitors to the ranch can admire the river’s source, 4,200-meter-high (14,000-feet-high) snow-packed mountain peaks. The bases of the mountaintops hug the valley’s arid landscape below. The Thompson Creek Divide area, which is also partially in Garfield County, is rich in biodiversity and natural resources. Three major forks drain from their Elk Mountain headwaters into the Roaring Fork River Watershed, including Divide Creek and the Crystal River. Hidden along the Crystal River, people soak in the Penny Hot Springs. The Crystal River is one of the last free-flowing rivers in Colorado, however last year it was on American Rivers’ endangered list due to a proposed dam and water diversions, which local ranchers depend upon. Click image to enlarge. 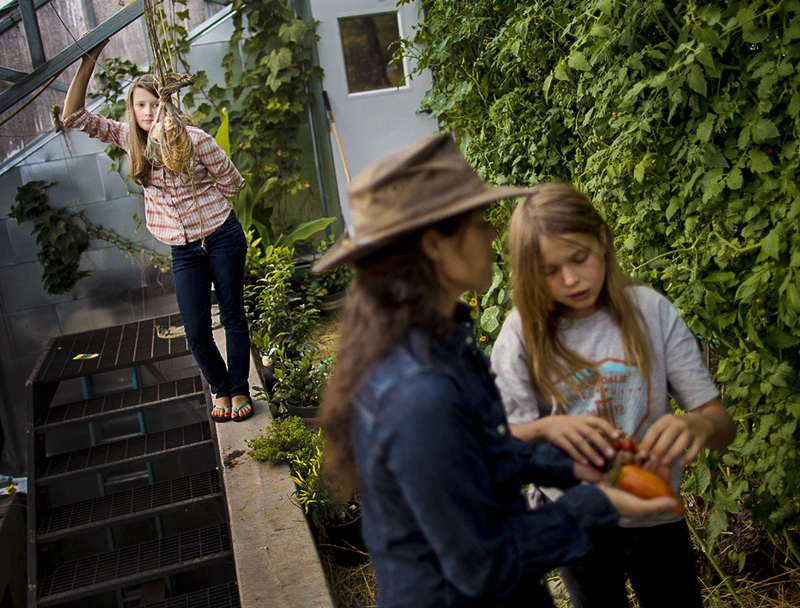 Lily Janssen (behind left) watches as her mother Ginger and sister Laela pick tomatoes from the family’s green house. Click image to enlarge. 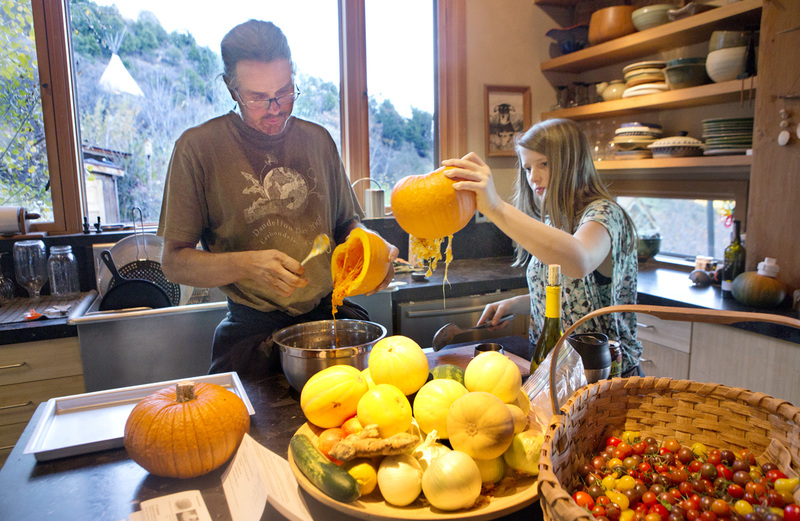 Robb Janssen and his daughter Lily gut pumpkins that were grown in their garden to make pumpkin pie from scratch. The teepee that Robb and his wife Ginger once lived in can be seen outside the hill. Click image to enlarge. 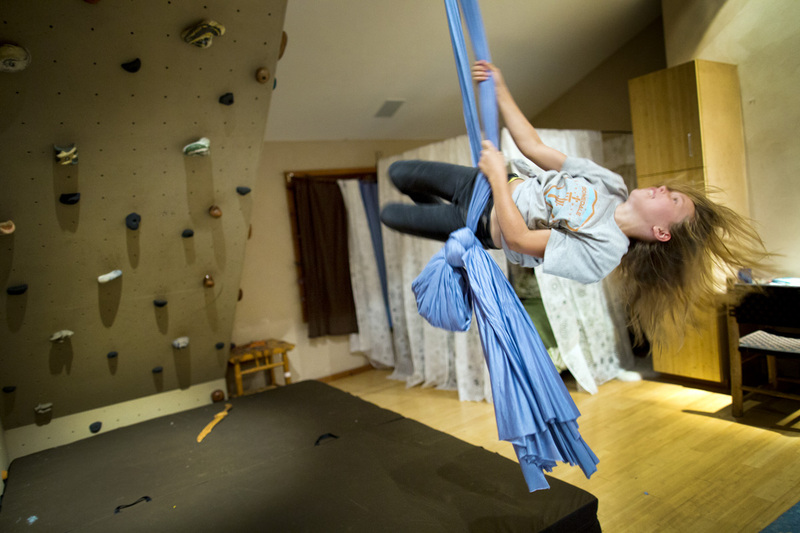 Laela Janssen swings from a sheet on the family’s indoor climbing wall. Her mother Ginger was once a competitive climber. Click image to enlarge. The family wants to have healthy cattle and is concerned that, if large-scale gas development goes into the heart of the summer high country, where the cattle graze, it will affect the cattle’s health. Fales helped start the Thompson Divide Coalition to try to protect approximately 42,500 hectares (105,00 acres) of federal land in the Thompson Divide area of northwest Colorado from the affects of gas drilling. The 12-boardmember coalition is comprised of local stakeholders and was formed in response to the Bush Administration issuing mineral leases in the Thompson Divide in 2003. Currently, 61 of the original 81 leases are active in the area. Some of the leases are in roadless areas and do not contain surface rules. Since then with the help of Fales the organization has made headway. Colorado State Senator Michael Bennet introduced the Thompson Divide Withdrawal and Protection Act to encourage ongoing conversation and provide opportunity for leases to be retired. Not only known for its ranching, the Thompson Creek Divide area also serves as a backyard playground to the town of Carbondale, where the beloved Mount Sopris and its surrounding spruce and aspen forest accommodate hikers, bikers, skiers, hunters, and fishermen. It is a lifestyle that is centered on outdoor activity. Locals feel very connected to the surrounding landscape. “I just love the river; it feels incredible,” said Allison Austin, a local resident, while looking up through rising steam at a thick blanket of stars and relaxing in natural hot springs along the Crystal River, just outside of Carbondale. Ranchers use the Crystal River for irrigation, but it also provides the town’s water supply. The Crystal is one of the only free-flowing rivers in the United States; it has no dams — yet. American Rivers included the Crystal on its 2013 list of most endangered rivers due to a proposed hydropower dam and water diversions. The drought in recent years has been stiff. Cold Mountain Ranch had enough feed last year because Bill and Marj managed their land well and had some leftover feed on reserve, but if the drought is as bad for another year, they will be forced to sell some of their cattle. Still, some ranchers, like Savage in Garfield County, felt they had no choice but to sell their cattle and replace them with natural gas drilling in order to keep their land. The region’s contrast between shale rock, dry desert landscape, and the vibrant green world of irrigated agriculture is most apparent from the air. Eco-Flight, a conservation organization, takes students up in a plane to see for themselves. In 2012, during their annual ‘Flight Across America,’ Eco-Flight flew over the natural gas fields of Garfield County, coal-fired power plants in New Mexico, and the Glen Canyon Dam. 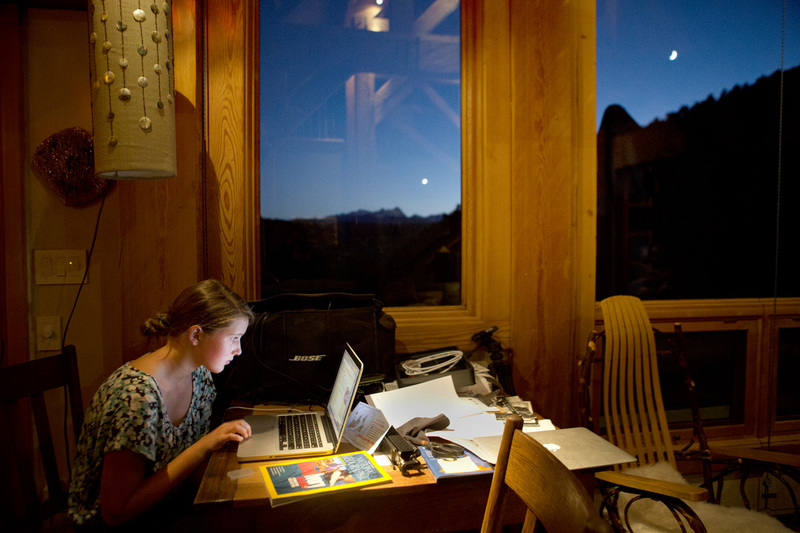 Lily Janssen uses her computer just after the sun has set behind the mountains in their front yard. Her father Robb says that he wants to try to conserve energy use, but he still wants it to be bright enough to “try and live a semi-normal life.” Click image to enlarge. Laela Janssen practices her trumpet while her father Robb encourages her. Click image to enlarge. 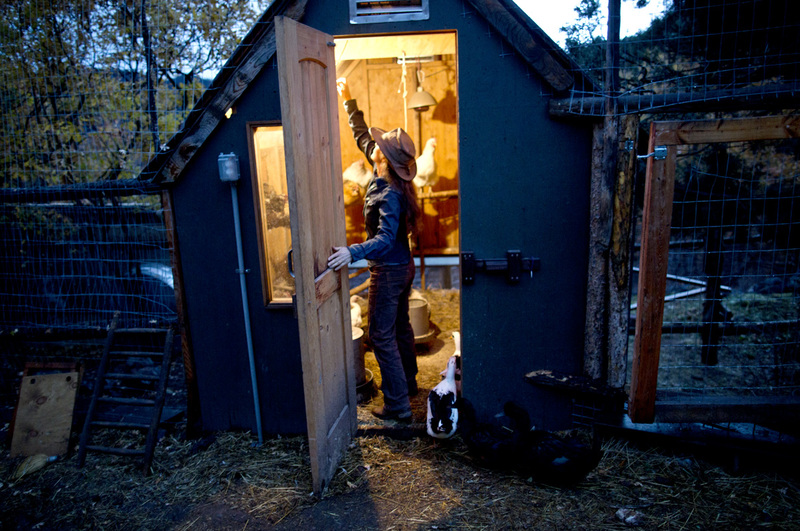 Ginger Janssen collects eggs from their chickens and ducks. The Janssen family also have goats that Ginger hopes to get milk from someday. Click image to enlarge. Laurel Hagen, executive director of Canyon Lands Watershed Council explained that over-allocation of the Colorado River leaves others with none, such as Mexico. She posed a hard question. “How do we get [the water] to one population over another?” she asked. 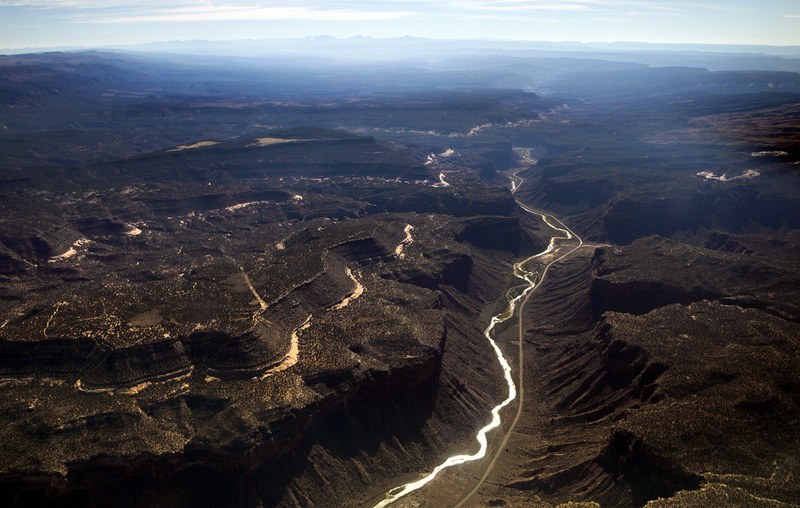 40 million people depend on the Colorado River for power, food, irrigation and recreation. 5.5 million acres of land is irrigated by the Colorado River. 4,200 megawatts is the generating capacity of hydropower plants along the Colorado River. 85 percent of the consumption area is desert. 15 percent of the watershed produces water. Basin diversions do not just include places like Denver and its suburbs but also big cities — like Los Angeles and Las Vegas — that hold water rights. Though cities are getting better at lowering their per-capita water demand, water use is still growing, because their populations are growing. Calvin Davenport, 28, is studying environmental science and grew up in Grand Junction. He was on the Eco-Flight trip and describes himself as an outdoor recreationalist who loves to hunt, kayak, bike, and ski. Heather Rousseau, is chief photographer at The Herald in Jasper, Indiana, and a contributing photojournalist to Circle of Blue, where she interned in 2010. She can be reached at hkrousseau@gmail.com. Keith Schneider, Aubrey Ann Parker, and Brett Walton contributed to this report. Back in the 70’s there were plans to add two more dams south of Parker on the river. Thanks to the tree huggers that plan went in the toilet. Maybe the general public would reconsider now. I was told that there would never be shortage if those two dams were placed. In addition to the water the recreation area would be a tremendous boom to the economy. I have lived in the desert 41 out of my 59 years. I have always been a water conservationist. The biggest issue I see here in Las Vegas is that there are people that move in from areas that have plentiful water, and they plant non-indigenous plants that require too much to survive. People allow their water to run down the streets disregarding the penalties to do it. In other words they don’t care enough to think about the future. So far no fraking here. It should be stopped everywhere. Wasteful use of our precious resources. On another note… you know about the Great Wall of China and the Hoover Dam… why not create a project on just as grand of a scale… consisting of dams and levies to capture melting snow and ice in the southwest region of what was once known as Lake Agassiz. A project of this magnitude would create jobs for decades, reduce downstream damage from flood waters every spring, provide the means for a Hydro-electric generating facility, the possibility for a multitude of lake area resorts, and create the benefit of a huge reservoir of fresh water that could be piped (another project) to the Colorado River to help replenish Lake Mead and save the southwest from the serious water shortage that it is only beginning to experience. In your graphic, it states…”4,200 megawatts is the generating capacity of hydropower plants along the Colorado River”, which is true when the lakes before them are full and the rated capacity can be reached. As level drops, so does the static head, and the plants operate at a lower capacity. The hydroelectric plants can “overstroke” their wicket gates to allow more water to enter the turbine, and generate more power in response to lower lake levels, but these efforts are limited.